Brattleboro Community Radio is an independent, non-commercial, all-access community radio station serving the greater Brattleboro area. Brattleboro Community Radio (BCR) is Brattleboro’s own independent and non-commercial 100-watt community radio station. Completely staffed and run by local volunteers, WVEW depends on year-round contributions by generous listeners and supporters. WVEW-lp is a 501c3 non-profit corporation, which means that your contributions could be tax deductible. Vermont Earth Works is an educational non-profit serving the communities of Southern Vermont. The mission of Vermont Earth Works is to increase public access to educational, cultural, and environmental opportunities. To achieve this goal, we work in partnership with supporters and volunteers promoting tolerance, sustainability, and understanding within our community. WVEW, our community radio station, will provide us with even greater opportunities to achieve these goals. Once upon a time, in July of 1998, a group of local citizens began broadcasting at less that one watt of power. Over the next 7 years that station, known as radio free brattleboro, would grow to 10 watts of power and became an important resource for its community. The history of rfb, like the history of Community Radio, is too rich and complex to explain in a few sentences. RFB was licensed to broadcast by its community – but not by the Federal Communications Commission. 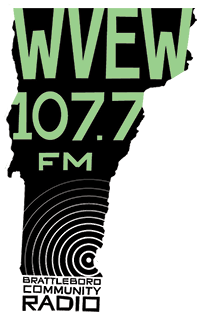 Concerned for the future of Community Radio in Brattleboro, Vermont Earthworks filed for one of the new 100watt Low Power FM licenses during a five day window in June of 2001. On March 3, 2005 Vermont Earth Works was granted a permit to construct a 100 watt LPFM radio station to serve the Brattleboro community. After years of patiently waiting, a chance had finally been given to provide Brattleboro with its own licensed, non-commercial, independent, community access radio station. Vermont Earth Works is committed to operating a station that increases community access to information and music, and that reflects the diversity of our community in its programming. Over the next year and a half, station volunteers held meetings and created committee and governance structures. Work on the studio space began. Equipment was ordered and installed. Then, one magical evening almost a year and a half later, during the evening hours of Friday August 25th, 2006, we began testing our signal. On Tuesday August 29th, the FCC changed our construction permit into a license. On Friday September 1st, 2006 at 5pm, Brattleboro Community Radio had its official broadcast debut. Brattleboro Museum & Art Center, Inc.